Two cantankerous, old-time vaudevillians are set for a reunion - and the sparks are about to fly. 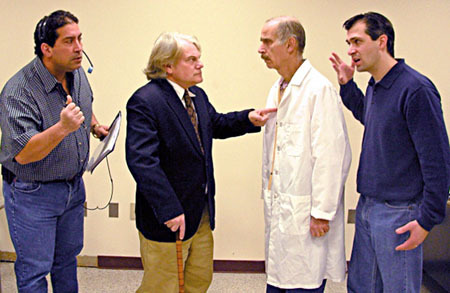 Join Pierrot Productions for "The Sunshine Boys" at Mercer County Community College's Kelsey Theatre Fridays and Saturdays, Feb. 20, 21, 28 and 28 at 8 p.m., and Sundays, Feb. 22 and Mar. 1 at 2 p.m. A reception with the cast and crew follows the opening night performance on Feb. 20. Kelsey Theatre is located on Mercer's West Windsor campus, 1200 Old Trenton Road. Al Lewis and Willy Clark shared the stage for forty-odd years before their successful vaudevillian act dissolved in acrimony. So, some 12 years later, when Willy's nephew Ben encourages them to reunite for a television special on the history of comedy, there are fences to be mended. With the two men barely able to be in the same room together, the jokes keep flying as arguments ensue over every detail. This classic by Neil Simon was produced on Broadway in 1972, with an Academy-Award winning film version following in 1975 that starred Walter Matthau and George Burns. In 1997, "The Sunshine Boys" paired Tony Randall and Jack Klugman in a Broadway revival, and was also adapted for television in a version starring Woody Allen and Peter Falk. Appearing in the production at Kelsey Theatre are: Paul Saunders s Willie Clark, Charlie Leeder as Al Lewis, Mark Violi as Ben Silverman, Edgard Garcia as Eddie, Melissa Rittmann as Comic Nurse, and Eve Connolly as Real Nurse. The show is directed by Ruth Markoe. Tickets are $14 for adults, $12 for seniors, and $10 for students and children. Free parking is available next to the theater. Tickets may be purchased online or by calling the Kelsey Box Office at 609-570-3333. Kelsey Theatre is wheelchair accessible and provides assisted listening devices upon request. For a complete listing of adult and children's events for the 2008-09 season, click here or call the box office for a brochure. 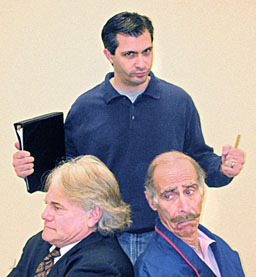 Clockwise from top: Ben (Mark Violi) tries to broker the peace between Uncle Willie (Paul Saunders) and his former vaudevillian partner Al (Charlie Leeder). The shtick is thick! From left are Charlie Leeder, Melissa Rittmann and Paul Saunders. Real life holds fewer laughs for Al and Willie. and Mark Violi as Ben. Melissa Rittmann and Paul Saunders.